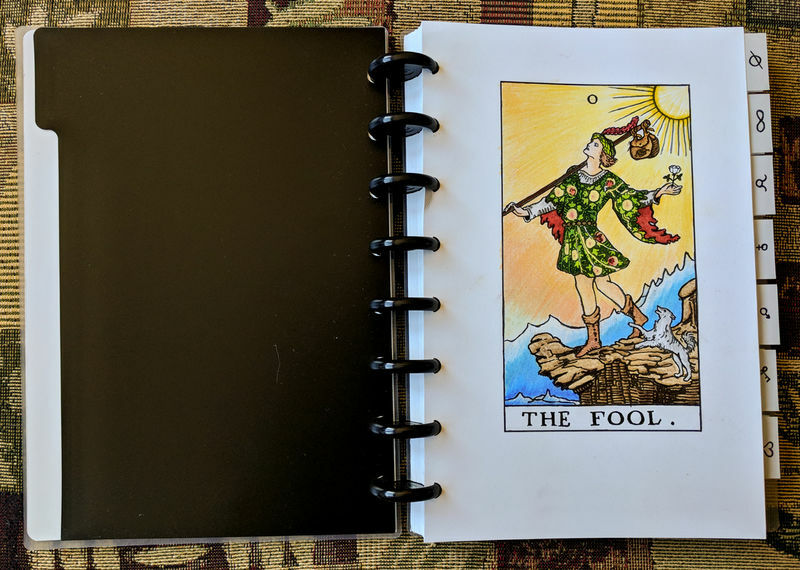 Grab the printable black and white tarot images I provided in a prior blog post. Choose the size you want to work with (8.5"x11" vs 5.5"x8.5") and print out the pages. I recommend using a nicer, thicker paper than your regular printing paper. I've been using this matte brochure paper optimized for laser printers and have been quite happy with it. The price is quite good for being crafty with it! The paper curls in the printer, but it can be uncurled with some work on your part. It's easiest when you have several sheets, so print out everything you were going to print, and then sit back and take some time uncurling the paper by gently rolling it in the opposite direction, paying particular attention to the ends of the paper. If you try to color the pages right from the printer you'll quickly notice the printer ink or toner will start to smear around. First spray your pages with a workable fixatif to seal in that ink, and then color away! When you're done coloring, use a finishing spray which, just like the workable fixatif, will seal in your work and prevent any smudging. Try experimenting with the workable fixatif! Since it seals in the layer underneath you can get different effects by coloring over an area again. You can take your pages to a print shop and they'll put them in a flexibound book for you. Personally, though, I love and adore discbound notebooks, and have amassed an enormous collection of notebooks in this system. Just buy a hole punch and the discs and you can bind your coloring pages in this system! The great part is the pages can be easily removed and moved around to different sections or different notebooks altogether. I am frequently rearranging the pages of my notebooks as I decide to organize things in a different way, going so far as to split, merge, or intermix notebooks on the fly. Discbound hole punch. Since this is different system from 3-ring binders, you'll need a totally different hole punch. Staples 8-sheet capacity paper punch. Discs. These are what actually bind the pages together. Etsy's DisboundMarketplace store offers black discs and multi colored discs for the best price for the smaller sizes, 3/8", 1/2", and 3/4". Staples has a better price for the 1" discs, and 1-1/2" diameter discs. You'll need at least 1" discs to put 78 pages of cardstock in one notebook. 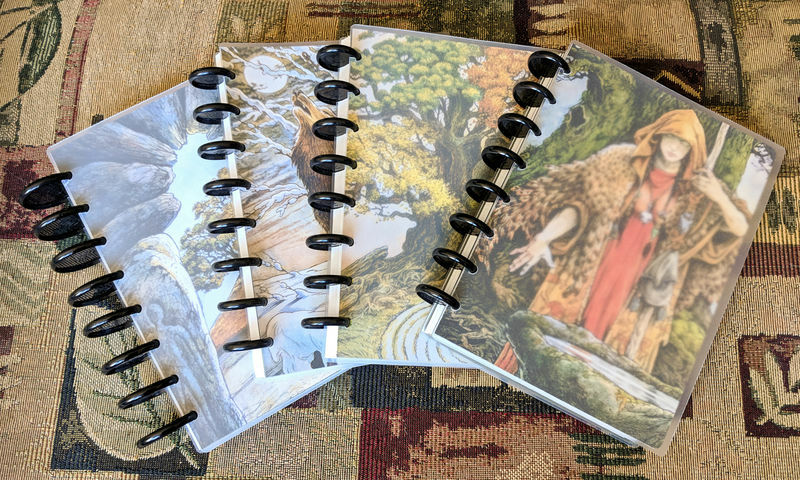 Consider making multiple notebooks! I have 3 notebooks: major arcana, court cards, and pips. Covers. Protect your pages by putting a cover on them. DisboundMarketPlace has several solid colors. Staples has assorted white, black, and clear covers and assorted patterned colored covers. Separators. Delineate major sections of the notebook. Letter sized and Junior sized. Page flags. I like to use post-it flags to deliniate the different suits. It helps me to jump straight to the page I'm looking for. I started this project because I wanted my coloring pages to be 5.5"x8.5", and since I love discbound notebooks, I went with the discbound route. You could have one book of just the 78 cards which would fit nicely within one journal made with 3/4" or 1" discs. But I didn't keep things simple, and I have ended up with FOUR tarot journals. When I started my project, I thought I could have a cute little book I could stick in my purse! Nope! I have pages for both the RWS deck and my primary deck, as well as copious notes for each card for each deck. Just, basically, this is a lot of information. I have one journal for the pips, one for the courts, and one for the major arcana. Since the other three became so large, I added one more to serve as a reference journal, which is what I would bring with me places while the others stay home. Currently the covers are clear ploly with the first page images of cards from my favorite deck, The Wildwood Tarot (artwork by Will Worthington). I plan to replace these covers with custom covers eventually. I'm thinking of tooling leather! But for now I'm focusing on my tarot studies. My coloring book doubles as a journal for reference information on each card. After each coloring page, I include my notes from reading up on other sources, and a more lengthy personal interpretation of the card. I flagged each card so I can quickly jump to it. I decided to use symbols for each card instead of numbers because the numbering system is not consistent for each deck. When I have notes about a specific deck, I can put it along with its related brethren from other decks. I divide it up by King/Queen/Knight/Page and then by suit. I flag each suit by the color of its element. 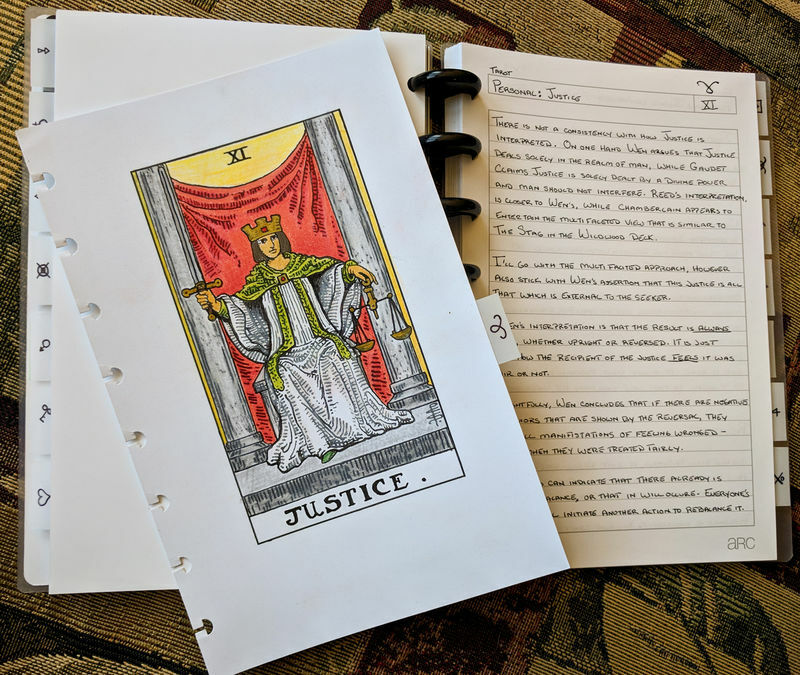 Similarly to the Courts Tarot Journal, this journal is divided by number, and then by suit. The bulk of this journal is reference pages for each card. There are just 78 pages for the tarot cards. The front is for the Wildwood Tarot interpretation, and the back for the RWS Tarot interpretation. No more, or else this journal will get unwieldy like the others! The goal is to keep it short and simple, and fit it within 3/4" discs. There's also a section to reference my favorite spreads, and lastly a journal of my tarot experiences. However, I am planning on pulling out the journal section from this notebook and keep this as a pure reference journal. I'll be making another journal that will collect all my personal experiences and keeping that journal more private. I organize the cards by Major Arcana, then by suit. I put a flag at the beginning of each suit so I can quickly jump to the card I'm looking for.